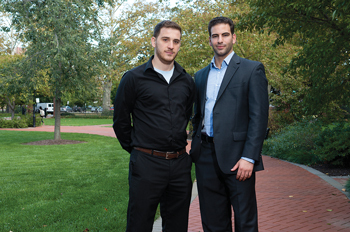 Two alumni from the Class of 2009, Louis Girifalco and Marc Reda, are only a few years out of college but already have found entrepreneurial success with a golf product called Rope It. A golf ball attached to a bungee and nylon line, Rope It was originally created by Girifalco’s father, John Girifalco, when Louis was 6 years old. Both Girifalco and Reda earned degrees from the Alfred Lerner College of Business and Economics and took advantage of business-related programs offered on campus. The product is marketed as a way to help golfers practice their swings in a limited space. It’s less expensive and more convenient than using a net, the company says. Reda and Girifalco, who met at UD and now are business partners, distribute the Rope It to major retail stores and hope to expand their product line to other sports as well. “We developed a lot of really strong relationships at UD, which we still have today, and learned a lot about what we are now doing,” Reda says. Eric Anthony Johnson, AS03PhD, is using his doctoral studies in UD’s School of Public Policy and Administration to oversee the transformation of a 50-block area surrounding Ohio’s University of Akron. As executive director of the University Park Alliance (UPA), Johnson is working on an ambitious, multi-million-dollar redevelopment project that he hopes will bring jobs and new investment to the community through efforts funded by the John S. and James L. Knight Foundation. In the two years since Johnson took the job, the UPA has developed a comprehensive business plan to attract new investment to the area. Improvements include construction projects, a community garden, the revitalization of a park, a block of renovated housing and neighborhood bike patrols. Johnson, whose doctoral research focused on the impact of policies and economic development investment in cities such as Atlanta and Detroit, says community engagement is too often the missing link when urban redevelopment plans are made. Important challenges, including the need for improved education and public safety, need grassroots effort, he says. Eric Zencey, AS76, 79M, an educator, author and a fellow of the Gund Institute for Ecological Economics at the University of Vermont, had an unusually busy fall, publishing two books and joining a U.N. working group on the global economy. Both books, which have environmental themes, and his work with the U.N. group extend the thinking and scholarship he began while pursing his master’s degree in political science and international relations at UD, Zencey says. 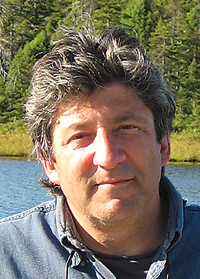 He focused on what the concept of sustainability might mean for political theory. The working group is preparing a report and a set of model policies that are expected to be completed in April 2014. The goal is to redesign the global economy to be ecologically sustainable. Zencey’s two new books are The Other Road to Serfdom and the Path to Sustainable Democracy, in which he takes on what he calls the “infinite planet” foundation of current economic theory, and Greening Vermont: The Search for a Sustainable State, which with co-author Elizabeth Courtney, tells the story of the Vermont environmental movement. When it comes to hauling home a Christmas tree and setting it up in the living room, perhaps pruning back a few branches, what’s a Manhattan apartment-dweller with no car, certainly no pickup truck, and no handsaw to do? Tyler’s Trees will deliver, set up (tree skirt and stand included) and remove a holiday tree for customers. The business has grown each year and in 2012 had projected about $200,000 in revenue from the delivery of some 800 trees as well as sales of wreaths, garlands and holiday lights. Peace Corps volunteer and UD alumna Meghan VanDeventer is helping to empower and employ more than 20 members of a local women’s cooperative in Belize by working to reopen a restaurant in the community after it was destroyed by fires in 2003 and 2005. The Sandy Beach Women’s Cooperative owns and operates the recently restored Sandy Beach Restaurant, which reopened last fall. The cooperative, originally formed in 1986 with the help of an earlier Peace Corps volunteer, became the first women’s cooperative registered in Belize. Through a small grant, the cooperative established and ran a successful lodge and restaurant until the entire property was destroyed. For seven years, cooperative members have been trying to restore the property. With help from VanDeventer and several local organizations, they built a new structure for the restaurant. The new structure is complete with a bar, patio, kitchen and dining area. In addition to helping with the funding and construction, VanDeventer worked with cooperative members to create a sustainable business plan and has led sessions on basic business management, bookkeeping and accounting skills. In November, the cooperative held an official opening ceremony for the restaurant. Members look forward to restoring the lodging portion of the property in the future. More than 1,915 Peace Corps volunteers have served in Belize since 1962. Kevin Israel, AS99, opens his standup comedy act with a topic that hits close to home for most college graduates. 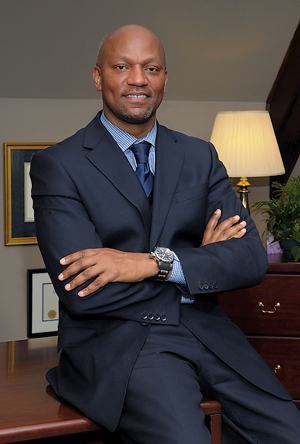 Israel graduated from UD with a degree in political science, spent seven years working for several New Jersey state legislators and then earned his law degree from Hofstra. But after less than two years at a law firm, Israel realized he hated the job. So what’s next for a disenchanted lawyer with mountains of law school debt? Become a standup comedian, join a bunch of other disillusioned but funny lawyers, and call your group Comedians at Law. 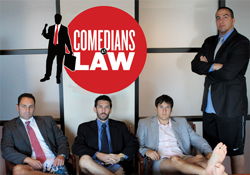 Sporting the motto “Bad at Law, Good at Comedy,” Comedians at Law is a five-man act of laughable lawyers who met in early 2011 and began booking shows at colleges and law schools and bringing down the house at law firm holiday parties. Citing Bill Cosby and Louis CK as his favorite comedians, Israel blends Cosby’s well-dressed nonchalance and CK’s brutal honesty (sans the brutal profanity) with his own sense of humor that stems from his childhood experiences of being the only Jewish kid in an all-white Christian elementary school. Pictured are, all from left, seated: Sandy Salzenberg Scheibe, Paula Batchelder Young, Jane Mack Groundland, Jean Newsome Renaud, Joyce Warrington Simpson and Lorna Hoehn Landis; and, standing: Gretchen Steinmetz Collins, Goldie Gebhart Davis, Judy Wofford Francis, Connie Parvin, Bobbie King Longyear, Karen Wilhelm Smith Bryson, and Beverly Pepper Steen. Not present for the photo were Dotty Bryant Booher and Beverly Wild Finch. 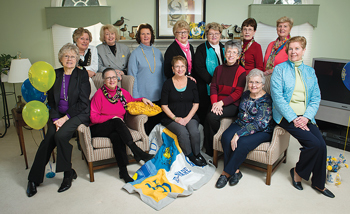 About a dozen freshman women met in September 1959 in the Kent residence hall and became friends. When they moved to the Harrington complex two years later, a few more joined their group. The close friends now have had an annual get-together for so many years that the tradition is still going strong as they prepare to celebrate their 50th class reunion in 2013. In February, they met at a home near Newark to reminisce and catch up on one another’s lives. Some plan to attend Alumni Weekend on May 31, and all plan to have another party next winter.